The original version of Brown Eyed Girl played by Van Morrison is considered by many as being THE original pop song. It’s a very fun, uplifting song that’s not that difficult to learn, even though there are a few techniques in here that you may not be used to yet. Our guitar lesson on Brown Eyed Girl is packed with useful information and practice drills that are essential to advancing at the guitar. The song itself can be considered a basic I-IV-V song in G, so it’s centered around the chords G, C and D. There is also an added 6th degree chord in the verse, the Em. Despite the simplicity of the I-IV-V form, there are a couple of interesting concepts we’ll be learning, so let’s just have a look at what you’ll find in the tutorial. We’ll start out by learning not just 1, but 2 versions of the all-popular intro to Brown Eyed Girl. The reason I decided to teach 2 versions is that the original one (played a bit higher up on the neck) is suited more to playing in a band situation, or with a backing track. If you were to perform this by yourself or on an acoustic guitar, the non-original version will be better. While learning to play the intro, we’ll also learn a considerable amount of theory. 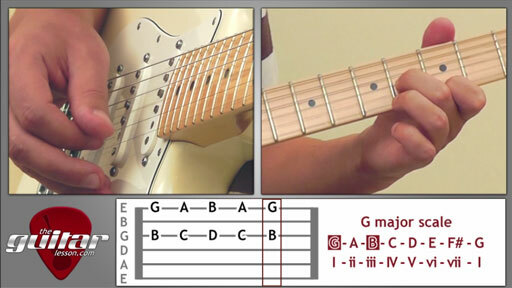 Firstly, it’s good to know your major scale, as the ascending-descending patterns root off the first 3 degrees of the major scale in G, than C.
You’ll also be learning about 3rds, which is used very often when playing major scales, to add a nice harmony to the riff. Playing thirds means playing not just the target note from the scale, but simultaneously playing the note 3 degrees away from it. Playing 2 notes at the same time is called playing a double-stop by the way, but I’ll touch more on the theoretical side of this in the downloadable tablature file, so make sure you read it as well. We’ll also be learning a strumming pattern which goes nicely with the song, as well as how to strum without using a plectrum. We’ll also touch a bit on using ghost strums while changing chords. Towards the end of the lesson, we’ll learn 2 distinctive riffs played by the 2nd guitar, which you’ll recognize right away. You can play those while jamming to the backing track, or with a guitar buddy even. All in all, the Brown Eyed Girl tutorial turned out to be a pretty long and info-filled one, which will really help you develop a number of very important guitar techniques. Brown Eyed Girl was released on the album Blowin’ Your Mind by Van Morrison in 1967. It was his first single after moving to the USA from his home country, Ireland. Brown Eyed Girl is considered by many to be one of the greatest songs ever written, earning Morrison many awards over the years, having been covered by hundreds of bands, being one of the best selling singles of all time, and having been inducted to the Grammy Hall of Fame. It is among the few songs that are registered to having been played over 10 million times on US radio stations. It’s also interesting to know that Van Morrison recorded this song right after moving to the US, and signing a not-so advantageous contract with a small recording company. He had no legal advisors at the time of signing, and based on the terms of the contract, he never received any royalties for Brown Eyed Girl… The fame he obtained thanks to the song would of course, establish his future financially, but he never received money for the massive sales of Brown Eyed Girl. Sorry, but you've reached a premium content area. The download of the Brown Eyed Girl tablature file is only available to premium members. Sorry, the same goes for the backing track. To download the backing track to Brown Eyed Girl, please log in and revisit this page. Hi, for some reason it won’t play, but you can download it to your PC and it plays there. I don’t know why it won’t play in the browsers though. I’ll contact my programmer to have a look at it, sorry about this.